Wildlife and highways in BC often cross paths. We do our best to keep both everyone safe and sound on their journey, and our work with Roosevelt Elk on Vancouver Island and on the Sunshine Coast of BC is no exception. Did you know the majestic Roosevelt Elk could once be found roaming around what is now Science World along the shores of False Creek in downtown Vancouver? Sadly, unregulated hunting for meat and hides during the gold rush of the mid-1800s contributed to the local extinction of these elk in the southern portion of their BC range and a large part of their historic range is now occupied by humans. Happily, provincial biologists have been capturing groups of nuisance elk from healthy populations and relocating them to suitable areas throughout southwest British Columbia. How do they do it? They focus on herds coming too close to active farms and along the highways. In addition to reducing the risk of wildlife deaths, this also helps reduce the wildlife hazard to travellers on roads frequented by elk. That’s where we come in to the picture. Thanks to the Environmental Enhancement Fund, we are able to work alongside a host of other agencies and organizations to track the movement of elk and then capture and transport the animals to other locations. This year a group of fifteen elk (8 females, 5 calves, and 2 males) were successfully captured from an area beside a Highway 19A north of Campbell River. They were transported first by road and then over water to be released at priority sites on the mainland coast. Estimated distribution and population density of Roosevelt elk in British Columbia (Figure 1, Management Plan for Roosevelt Elk in BC (2015). Beginning on Vancouver Island in 1978, translocation became a core elk management tool almost immediately. Since 1978, there have been more than 30 projects undertaken on the Island. The first translocation from Vancouver Island to the Sunshine Coast was back in 1987. There have been a few other moves between the island and the Sunshine Coast since then, but the vast majority of efforts now happen within a region as opposed to between them. The first translocation within the Sunshine Coast occurred in 1996. 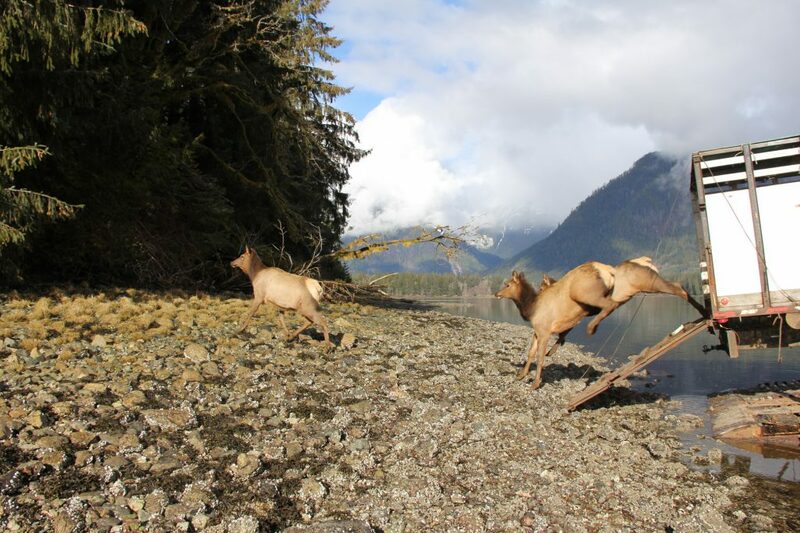 Since about 2000, captures have been happening annually on the Sunshine Coast, moving elk within the South Coast Region. More than 850 elk have been relocated in the Coast Area since 1978, with approximately two thirds of these elk moved around the South Coast Region since 2000. Yipee! This type of translocation is key to the recovery of Roosevelt Elk, they help improve how the ecosystem works and provide future opportunities for recreational and food uses. 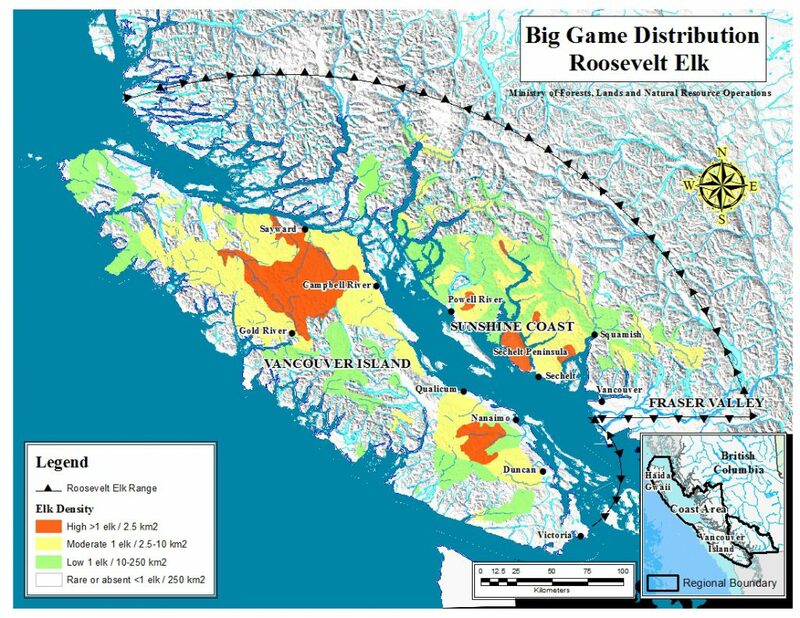 Although their global distribution is smaller and more fragmented than it was pre-1900, we can happily say that the BC population is growing, especially where trans-locations have re-established Roosevelt Elk through their historic range. How’s that for a comeback story? It sure makes us happy to keep wildlife and travellers safe in this way. Do you have any feedback or input on this or anything else we do here in the BC Ministry of Transportation and Infrastructure? Let us know in the comments below. In hopes of writing my first fiction piece for youth over 12, I want to know if ever a black bear, a grey wolf, and a Roosevelt elk could get along in a patch of the Mid-Coast(Smith Inlet to be exact)? My thesis is that my character befriends all over a period of time, so that they visit, relax, and play around his cabin. Then in an extraordinary cross-species move they save him from a natural disaster. That salvation depends on all three cooperating with rare intuition and intelligence. Hi Ron, Wolves are predators and hooved animals, are their preferred prey. This includes elk, deer, bison, moose, domestic cattle, muskoxen and caribou. Even a single wolf can hunt these successfully. They are also known to eat young bears. (Source: http://www.whatdowolveseat.info/). From http://www.whatdobearseat.info/: “Black bears sometimes catch baby deer, cows and moose, but they are more likely to try to steal carcasses from more active predators like wolves, coyotes and cougars. Grizzly bears, like black bears, eat a lot of vegetation, but they also eat more meat than their cousins. Grizzly bears hunt deer, elk, moose and bison regularly, along with fish like salmon and trout.” From http://www.whatdopolarbearseat.info/: Polar Bears hunt for marine mammals like seals, and also eat trapped whales or whale carcasses. Reindeer, eggs, birds and Arctic foxes can also be part of their diet. Hey Ron. If you were to have a bit of knowledge, you’d know that black bears and wolves are predators. Black bears prey on elk calves in the spring and wolves eat elk. No, they are not friends. Use your brain. Your thesis sounds like you put no thought into it. Any kid that reads your story is going to be another uneducated individual believing in a bambi-like fairytale. Anyways, no – an elk, wolf, and bear are not friends, it’s real life. Why are these animals really being relocated? Looks like a lot of partnerships with Gun Clubs. Is this all about hunting them? 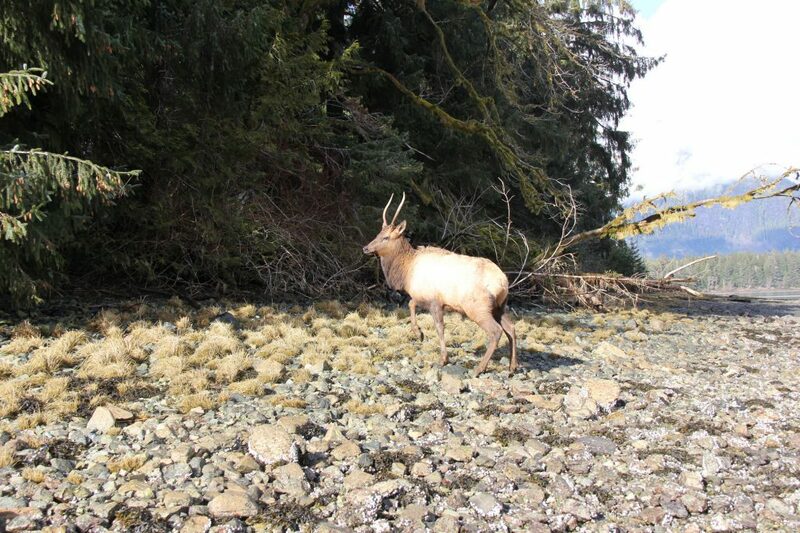 While sustenance and recreational uses are a recognized benefit of the successful re-establishment of Roosevelt Elk in coastal areas – the primary goal of the program is to re-establish Roosevelt Elk into remote and under-utilized watershed habitats. Their presence in these areas provides a significant benefit to the function of these ecosystems. Although their global distribution is smaller and more fragmented than pre-1900, the BC population is growing, particularly where translocations have re-established the elk through their historic range. While natural dispersal of Roosevelt Elk to new watersheds is slow to occur, translocation of elk has proven effective in re-establishing populations into remote watersheds. With translocation of herds into underutilized habitats, the benefits to the ecosystem function and from the uses of this species can be appreciated earlier than would be otherwise possible. Roosevelt Elk are on the Provincial Blue-list and are subject to conservative Limited Entry Hunting (LEH) and harvest by First Nations in the Coast Area. Hunters submit approximately 16,000 applications annually for approximately 200 Roosevelt Elk LEH opportunities on Vancouver Island and First Nation hunters harvest as many elk through harvest arrangements between governments. These uses generate direct revenue to the Province, the Habitat Conservation Trust Fund, as well as tourism benefits to small businesses in many local communities. Thanks for your comment – we hope that this helps answer your question. Congratulations on the success of your Roosevelt Elk Reintroduction program. Can you provide any information on the Elk in the Fraser Canyon? windshield could really take the glow off the day! Hello Ramblin’ Ryan and thanks for your email! We have sent your questions forward to the lead ministry on this initiative – Ministry of Forests, Lands and Natural Resource Development. They should have an answer to your questions. Stay tuned! Our apologies for the delay in tracking down more information for you. Those wildlife biologists spend a lot of time out in the field! We hope that this helps some. Thanks again for connecting with us here.